Late in the summer of 1841 a group of families left Marion County, Kentucky, in three ox and horse drawn wagons led by Captain Kim Amyx. Their destination would require some 500 miles and six months of challenging travel. They were searching the unknown for a new life in the virgin wilderness of the Ozarks, and would end their journey near present day Hodgson Mill. It is reported that members of this wagon train, along with other previous settlers, set about to establish a new community known as Rockbridge. The original town and mill site was located near the confluence of Spring Creek and Bryant Creek. It was the county seat of Ozark County, and encompassed what today is three separate counties: Douglas, Howell, and Ozark. After a few short years, the town and mill were destroyed by fire during a civil war battle. In 1868, B.V. Morris rebuilt the original mill on its present day location. The Mill’s reconstruction was followed by the reinstatement of the post office, a general store, Masonic Lodge, bank, church, school, blacksmith shop, and a large farm house, known today as the White House. The village of Rockbridge was a gathering place for people from the countryside. A trip to the mill was a great occasion, enabling people to visit old friends and neighbors, to get their meal and flour, to utilize the post office, to vote on Election Day, and to get news of the outside world. In the 1895, Sidney and Edgie Amyx (Lile’s parents), were married at Rockbridge. The couple homesteaded the land directly above Rockbridge Spring. Ralph Amyx (Lile’s brother) was born on this site in 1907, now the site of Ralph’s Ridge Condos named in his honor. Activity flourished during the latter years of the 19th century and continued until the 1920’s and 1930’s, but as gasoline power and better roads came along, the need for the mill and the blacksmith shop gradually declined. Eventually there was not a need for the general store. The world changed and Rockbridge was almost abandoned. Only the post office remained to mark the existence of this once bustling community. In 1946, the Amyx family moved to Rockbridge. Lile and Edith Amyx had a saw mill on the lower part of the stream, and also worked in Gainesville in the family business, the Amyx Auto Company. 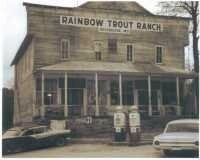 In 1954, the family began to develop the Rockbridge Rainbow Trout & Game Ranch. Edith became Postmaster of the Rockbridge Post Office, the oldest post office in the county. The days were long, and the nights short as they worked diligently to bring life back to the Rockbridge Village. Once again, people from the towns and countryside came from miles around to visit friends and neighbors, enjoy a good meal, and vote on Election Day. This time they came to bring news from the outside world and enjoy world class trout fishing. Years later Rockbridge still exists with all the stamina, character, and the way of life we so greatly admired about our forefathers. With a little luck and a lot of hard work, the little village in a valley of the Ozark hills will continue to create history and provide memories for all who visit.